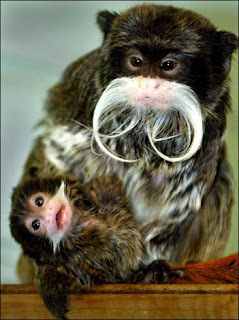 An Emperor tamarin (Saguinus imperator) with his infant. As Fathers Day approaches, I feel that it is appropriate to write a little bit about the Callitrichids. Callitrichids or Callitrichidae are New World Monkeys that includes tamarins and marmosets in it's genera. Callitrichids are generally "small-sized" and can be found in South America (New World). They live in social groups that are sometimes referred to as "cooperative polyandrous group". Callitrichids are usually polyandrous but a broad range of mating system had been recorded in the field (Falk, 2000). Generally, one female mates with multiple males in the group, although every individual in the group shares some responsibility in caring for the infant. Except the alpha female, other females in the social group do not reproduce. These females helps out in caring for the alpha female's offspring (Falk, 2000). But what does Callitrichids have to do with Father's Day, you say? 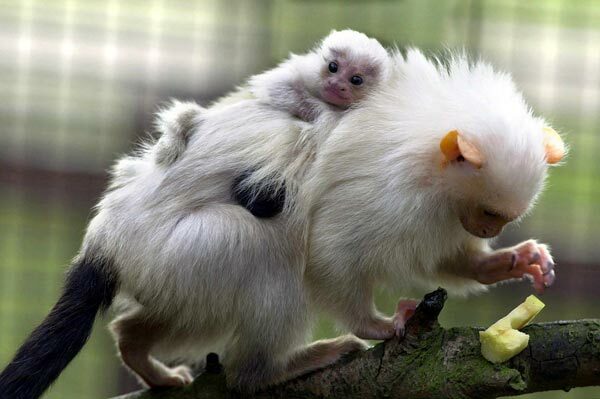 A baby Silvery Marmoset (Mico argentatus) clinging to its father. Callitrichids are well known for its hardworking fathers. Paternal care is rare but not uncommon in primates. While some males have been observed taking care of an infant, true paternal care is defined as a biological father taking care of his biological offspring. Paternal care in Callitrichids are about the same and sometimes more than maternal care. With the exception of lactating, daddy does everything mummy does. Golden lion tamarin twins (Leontopithecus rosalia) clinging on their father. Other males in the group also helps out in caring for the alpha female's offspring. Field studies show that the presence of two or more males is associated with infant survival (Falk, 2000). The presence of at least two males in a group is thought to lessen the burden of the mother because these males act as principal caregivers for the infant by carrying them and providing them with solid food (Falk, 2000). Callitrichids are small-bodied animals, therefore they have high metabolic rates. These infants need food constantly and without the help of the males, the mother will never be able to keep up with feeding the infants, let alone carrying them around (Falk, 2000). So on this Father's Day, let's celebrate one of the hardest working fathers (and males) in primate societies. Falk, D. 2000. Primate Diversity. New York and London: W.W. Norton & Company. Photo by Julie Larsen Maher (WCS). 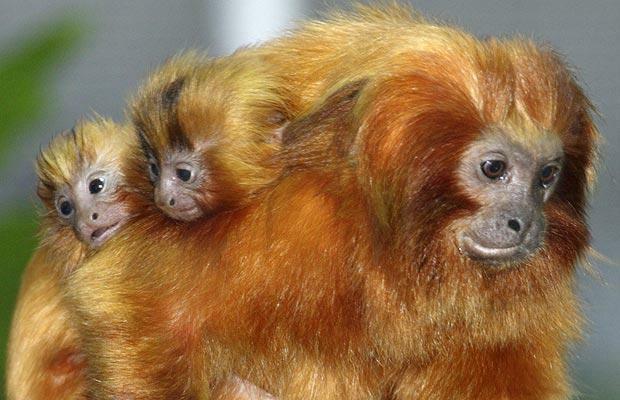 The Prospect Park Zoo wants you to help name their Geoffroy’s tamarin twins. Born in April Cannoli and her mate Napoleon, these twins are now about 2 months old and they need a name! Click here to suggest names for the twins. Winning names will be announced on June 21st online. I have personally submitted the name Maya and Milo. What do you think? You can also watch a video of these babies and their parents on the zoo's website (click here). In the meantime, if you are at the zoo, say hi to the tamarin family in the Animal Lifestyle rotunda (where the Hamadryas baboons are also located!). Geoffroy's tamarin (Saguinus geoffroyi) belongs to the Callitrichidae (Callitrichid) family. They are New World monkeys, native to Colombia and Panama. Mainly frugivores and insectivores, they do eat exudates (tree gums and tree saps) and green plant parts. Tamarins only feed on exudates when it is readily available, for example, holes left by wood-boring insects and rodents. Unlike marmosets (another Callitrichid), tamarins do not have the adaptation for gnawing on tree barks. 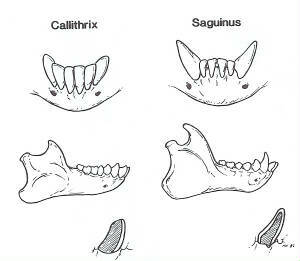 The difference between marmoset (left) and tamarin (right) lower dentition. Illustration from John Fleagle, Primate Adaptation and Evolution, Second Edition (1999). Tamarin's dental morphology are not suited for gnawing on tree barks because their lower canines are longer than their lower incisors. Marmosets, on the other hand, has long forward turning lower incisors that are the same length as their canines. Geoffroy's tamarin lives in a multimale-multifemale social system and a group generally consists of three to five individuals. Their mating system is usually polyandry (one female, multiple male). Geoffroy's tamarin, like all Callitrichids, almost always give birth to twins. UPDATE: The twins were given the name "Tira" and "Misu". 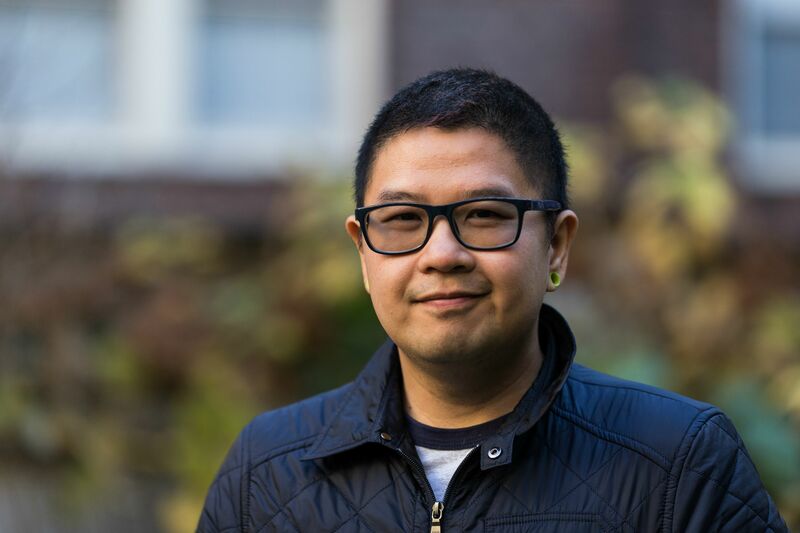 Recent archaeological find in Koobi Fora, Kenya suggests that our early ancestors might have dined on "seafood" to compensate for the energy and nutrition needed for the expansion of the brain. The excavated site dates 1.95 million years ago, which predates Homo erectus, reveals distinct faunal remains (some with evidence of butchery) and Oldowan artifacts. 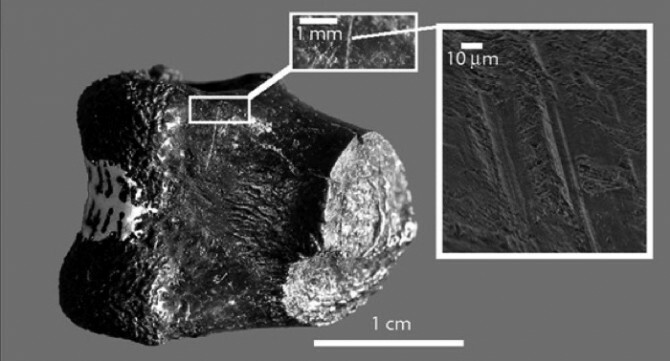 Detailed in latest PNAS edition, archaeologist David Braun and his team found an assemblage of bones from terrestrial and aquatic animals such as fishes, turtles and even crocodiles along with stone fragments (Oldowan tools) that are thought to be used to cut these animals with. 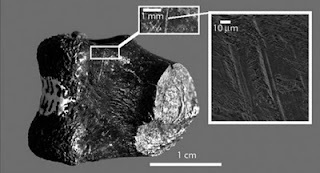 Photograph and scanning electron microscope image of a reptile bone scored by cuts. Image from PNAS. Braun posits that if these early hominins indeed ate these terrestrial and aquatic animals (fishes, turtles and crocodiles), then they would have ingested enough calories and fatty acids needed for the expansion of the brain without having to scavenge for animal remains. Braun thinks that these small-bodied hominins would have avoided the dangerous risk of confronting with larger scavengers. Crocs and fish key to human evolution on PhysOrg. Did Dining on Seafood Help Early Humans Grow These Big Brains? on Discover. Fossils Suggest Menu That Made Humans Possible on Wired. Early hominin diet included diverse terrestrial and aquatic animals 1.95 Ma in East Turkana, Kenya (Braun et al., 2010) on PNAS.